With all the good progress we’ve made in the last century, political correctness cannot be counted as one of our crowning “improvements”. The truth now has to be curtailed, distorted, and twisted to appease a few touchy individuals who take themselves too seriously. To that I say, stereotypes, though they attempt to confine a large group into a smaller niche, are often based on truth and fact. A few stereotypes that are based on truth: most white people cannot dance, Irish people love their beer, Italians love food and wine and talking (although I don’t know anyone who doesn’t love Italian food and wine and conversation), at African American barbecues you’re likely to find fried chicken and watermelon and people that can dance, most white-collar crimes are committed by people with white faces, most acts of terrorism are committed by radical Islamists, and most black on black crimes are committed by… wait. He’s a badass dude who’s self-reliant, strong, and quiet. He doesn’t wear his heart on his sleeve. He puts his head down, works, doesn’t complain – ever – and he takes care of business (TCB, as the kids say). He’s assertive, ambitious, and courageous. He likes steak, beer, and whiskey. He’s good with his hands. He’s the protector of his tribe, the hunter-gatherer of his clan. I love this “stereotype” of the real man. And it exists for a reason; many of the men we admire, look up to, and who have had a great impact on our lives, possess these attributes. We’ve formed this stereotype as the result of years of positive evidence that shaped our ideal of what masculinity is. Where the political-correctness epidemic is wreaking havoc is in our definition of what masculinity is. You’re not going to have all of these attributes. You may not like whiskey and such, those things are by-in-large trivial aspects of manliness. But assertiveness, being a badass, self-reliant man is something to be aspired to and admired! Real men shouldn’t cry and wine and complain. They should learn how to be self-reliant and strong. They do need to be assertive and ambitious. We can’t let the politically correct society we live in change who we strive to become. Am I simplifying the issue? Of course. But it doesn’t need to be a complicated issue filled with feelings and touchy subjects that many want to avoid talking about or keep out of bounds. Part of that starts with us, and how we improve and become the men we’re already on our way to becoming. But it also starts with us not being so damn touchy and insecure. There are two, very different sexes in this world. We have different essences, make-ups, and physical attributes. Cherish both. Don’t try to mold them into one. What’s awesome – for us – is that we can develop these attributes everywhere, even in the gym. But you can’t just workout, you need to read the rest of the article to discover how you can build manly attributes next time you walk into those halls filled with iron and sweat, and hopefully a few babes. Ah the ol’ courage, resolve, and strength of character. I’ll admit that a lot of the guys I see in the gym appear to not be developing grit. As they lift their shirt to flex their abs, or get lost in their own eyes in front of the mirror, all masculinity has left them, and vanity has been left in its stead. So how do you, the guy who wants to become a better man, not merely a stronger, more fit dude, develop grit, this all-important attribute of a real man, in the gym? You develop grit by working hard for a long period of time. You don’t let your emotions get in the way of your workout. You don’t take the easy way out of a set. You don’t adjust your workout to make it easier because you’re having an off day. Don’t be swayed by your emotions. Don’t avoid the hard work you’re required to do in your program because you don’t feel like it. Developing grit in the gym, will show itself in your day to day actions. Toughness isn’t an optional characteristic for a real man, just like grit isn’t. These are necessities if you’re to call yourself a man. In creating and developing physical toughness, you forge emotional, spiritual, and mental toughness as well. Toughness comes from willingly venturing in to adverse situations, and persisting anyways. Situations like pain. The longer you can withstand pain, and the more you begin to enjoy the uncomfortable feeling of said pain, the tougher you’re going to become. Choose your workouts wisely. If you want to develop toughness in the gym that will also show itself outside of the gym, create a lot of pain in your workouts – within your muscles, of course. Some of the sets we use in the PowerHowse Challenge are brutal. You create a lot of lactic acid, which will help you burn more fat and build more muscle, but you’re going to have to work hard. Sure, you’ll get great physical results, but the unique sets we use in the Challenge will also help you create true toughness. A real man clearly has a good work ethic. I’m adamant on this point, you can’t be a real man if you’re afraid of working hard, and working hard in the gym is something that a lot of people hate. That’s the thing with hard work, much of the time it needs to be focused on doing things we don’t like, rather than simply doing what we enjoy all of the time. Even within my business, that I absolutely love, there are a lot of things that I just don’t enjoy doing, that have to be done. The gym is no different. You have to work hard to get results. Practice perfecting your work ethic through pain and sweat and sometimes blood, and allow that work ethic to then translate into other areas of your life. I’ve never met a guy I’d consider a “real man” that doesn’t also have discipline in his life. We can’t accomplish much of anything without it. We need it. And within the gym is a great place to practice it. Stick to your workouts. Don’t take longer rest periods than you’re supposed to. Finish all of your sets, exercises, and even your stretching. To build your ideal body you need discipline. Let the discipline you use in your training and with your diet, translate to the discipline needed to build a business, or to accomplish any other goal you may have. I love the fact that forging a great body requires a good amount of time. It isn’t immediate. It can take years, let alone months. I love it because that automatically makes those who have a body they’re proud of, a select few, because it’s only a select few who are ever willing to work hard, for a long period of time, without giving up. You’re in that group, aren’t you? It’s those who outlast their failures that accomplish the most in life. And a real man doesn’t quit, ever. Practice persistence with your training goals, and let your development in the gym, also lead to development in your personal life. While I’m not merely talking about physical strength, but rather emotional and spiritual and mental strength as well, physical strength is important. I don’t know any “stereotypical real men” who are weak. Actually, a stereotypical real man has to be strong, because he’s the caretaker for his tribe, the hunter-gatherer for his clan. Become a physically stronger man in the gym. Don’t simply let your goals rest on aesthetics, after all, a real man isn’t vain. Grow stronger to become tougher and manlier. How to power and strength differ? Power is going to help you knockout a would-be attacker. Strength will help you carry your wife to her bedroom for a passionate night of love making. Needless to say, you need both. Spend at least a week in every month focusing on athletic power within your workouts. This doesn’t have to be the sole purpose of the workout, for example, you can start your workout with cleans, then focus on building muscle, and end off with some box jumps. A man has a firm handshake. Forget the stereotypes, I’ve never met a man I respect who didn’t have confidence behind his handshake. And most of the “stereotypical” real men you encounter will have strong hands, because they use them. They use them to fix and hammer and carry. They use them to chop wood, to hold on to a human hanging off the edge of a cliff, or to fight lions. A man needs strong hands. And strong hands, as we’ve already eluded to, come from lifting and carrying. Perform deadlifts, farmers walk, and hang cleans – all without straps – to improve your grip strength. All of this power and strength and bravado is rendered useless if it doesn’t last. Don’t set yourself up for failure by only focusing on one-off power or strength. Make sure you’re becoming more athletic. Make sure you’re improving your endurance along with your strength and power. Add sprints to your routine to make sure those lean muscle gains aren’t only for looks, but also to make sure you’re not losing that power and strength with long, overdone bouts of cardio that will raise your cortisol levels and send your muscle running for its life. 10 sec sprint, 50 sec recovery. Repeat this for 10 sets. You can run hills, stairs, or head to the track. But don’t hop on the treadmill. A man isn’t a hamster, running but going nowhere. Get outside and enjoy nature while you build an epic, manly physique. Pride can be used to a man’s detriment if he’s too proud not to be humble. Assuming that humility is a trait that you already possess, it’s time to develop a sense of pride in the man you are. Pride comes from character. You’re a proud man if you’re happy with who you are as a person, but also with what you can do and accomplish. Develop a pride in how you look and perform first, in the gym, and then allow that pride to carry over to who you are as a man. A proud man works hard because he’s too proud to be lazy – start this in the gym. A proud man makes necessary sacrifices for the greater good of his goal, dream, and family – start these sacrifices in the gym. 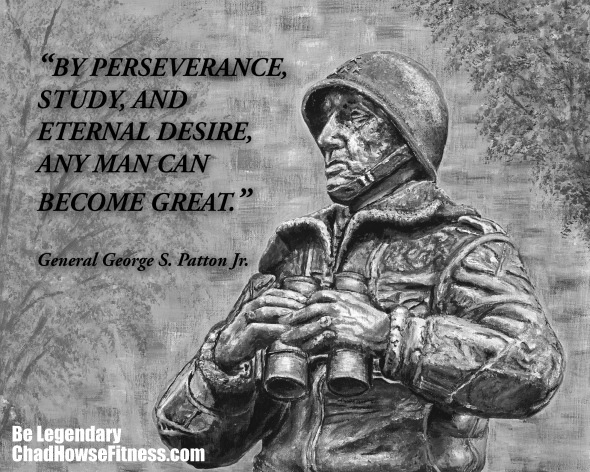 Become a real man through hard work and persistence. Take your time. Develop into the guy you know you can become, and use the gym as a means to this honorable end. Stay strong. Work hard. Be Legendary.